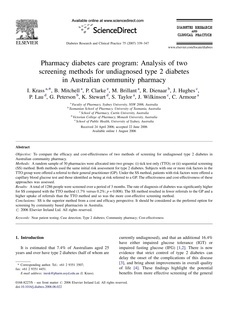 Objective: To compare the efficacy and cost-effectiveness of two methods of screening for undiagnosed type 2 diabetes in Australian community pharmacy. Methods: A random sample of 30 pharmacies were allocated into two groups: (i) tick test only (TTO); or (ii) sequential screening (SS) method. Both methods used the same initial risk assessment for type 2 diabetes. Subjects with one or more risk factors in the TTO group were offered a referral to their general practitioner (GP). Under the SS method, patients with risk factors were offered a capillary blood glucose test and those identified as being at risk referred to a GP. The effectiveness and cost-effectiveness of these approaches was assessed. Results: A total of 1286 people were screened over a period of 3 months. The rate of diagnosis of diabetes was significantly higher for SS compared with the TTO method (1.7% versus 0.2%; p = 0.008). The SS method resulted in fewer referrals to the GP and a higher uptake of referrals than the TTO method and so was the more cost-effective screening method. Conclusions: SS is the superior method from a cost and efficacy perspective. It should be considered as the preferred option for screening by community based pharmacists in Australia.